Richard Marsden and John Patterson, head instructors of the Phoenix Society of Historical Swordsmanship, sparring. Last week I covered giving students aligned goals, which are goals that are achievable and presented in small blocks rather than grand dreams without a plan. This week I will delve into sparring. Sparring is not reality. This needs to be understood for the instructor. There are numerous examples of our the artificial nature of sparring reveals itself. First, sparring blades, be it a saber, longsword, rapier or even a dagger can not actually penetrate the opponent. This means certain techniques cannot be performed without some modification. In this Capo Ferro plate the rapier has gone over a foot THROUGH the opponent's head. In sparring this is not possible. The rapier will strike the helmet and skip off, or if somehow you managed to keep the point on, the blade wound bend and the opponent's head would turn and it would skip off. If both opponents were really dedicated, maybe, just maybe, the rapier blade would stay on target, the opponent would not budge, and the blade would bend and break. The point being is that in sparring not all things are possible. The thrust in particular cannot go through an opponent which is why in sparring matches it is not unusual to see quick jabs of the sword rather than dedicated thrusts. The same goes for cuts. A synthetic, a feder, a blunt or any other sparring weapon will not actually cleave a person in two. A strike which may very well in real life be disabling and fatal can result in the opponent being struck and delivering an afterblow. The usual response to this is to teach students to always be covered when they both thrust and cut, or to be able to strike and escape before the afterblow can be delivered. In terms of tournaments, afterblows are weighted a variety of ways, often so as to not make them attractive. Protective gear is another factor when looking at sparring opposed to reality. Many of HEMA's treatises were performed by people wearing limited or no armor at all. From the 16th century on duels were more often performed while wearing shirts, not padded jackets or armor. Today, it is not uncommon for students to wear heavy jackets, gloves, helmets, throat-protectors, elbowpads and knee and shin guards. Some, quite rightly, feel invulnerable and behave in a manner that would be highly risky in an actual duel with sharp weapons. On the other side of the equation, some HEMA was performed in armor, including fabric armor. Fiore de Liberi's art for example often depicts men in padded jackets. In the 15th and 16th century, a doublet could protect against multiple stabs. Just while wearing too much gear can give a student a sense of invulnerability, when such gear is appropriate it can cause confusion in what kind of hit is valid. For example, if one were fencing in the 17th century in their shirt, a thrust with very little effort behind it may very well be enough to penetrate the body. Yet, in the 15th century, a small jab with the longsword may, or may not, be able to penetrate a padded jacket, and it certainly wouldn't penetrate armor. While in sparring too much power resulting in injuries is a concern, too little power resulting in students accepting insufficient strikes is just as problematic. Finally, sparring has no consequences. If you get hit, that's fine, you step out of the ring and someone else steps in, or in the case of a tournament, perhaps you lose out on some points, but get another chance to come back. In reality, every hit you receive has potentially lethal consequences. In short, sparring cannot match reality. Certain techniques can't be performed. Too much or too little power can be a concern. The safe nature of it doesn't mirror reality. Sparring has artificial aspects to it, however it remains one of the best teaching tools. Those who never spar do not fully learn their art and the issues with sparring can be somewhat mitigated. First, there is a debate often had about how important sparring is or is not to learning a martial art. In HEMA very few groups, (none that I know of actually) choose not to spar at all. Some schools and clubs spar more than others, and there are those that rarely spar at all. I can say with tremendous confidence that sparring is vital to learning the art, despite the issues underlying sparring. I have in my school two instructors from another form of martial arts. They came to me to check out HEMA and I was delighted because both of them are skilled at instructing hand to hand, dagger, and wrestling- areas my sickly thin self never quite excels at. Both learned from me various HEMA. Both wanted to get into sparring. Both were absolutely terrible at it. Not so bad that it was embarrassing, but bad in that it made little sense. How is it that two guys, with years of martial arts experience, have a hard time sparring? There are some reasons behind this, namely that the weapons we use were new to them- but it was more than that. There was a definite lack of experience in fighting with a weapon against someone else with a weapon. The two guys knew things, many things, yet could not apply their knowledge correctly and that is where sparring shines. 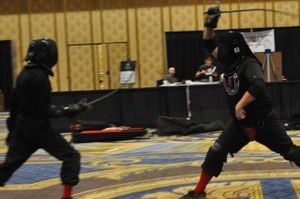 Sparring is as close to reality as you can get and sparring lets you apply your HEMA knowledge. That application works best against a resisting opponent. Now, just in case my two martial arts instructors read this and get angry, let's talk about the good news. After a month, neither was bad at sparring at all. Both are doing quite fine, and one nearly broke my arm. It turns out being a power-lifter and a martial artist is a good combination. So, all is well. The knowledge was already there inside them, they took to HEMA techniques like ducks to water, they just needed to learn how to apply it. One of them likes sparring so much as a valuable tool to teach that he is getting custom sparring swords made for his group and wants to introduce safe sparring into his community. He wants his martial arts to be like HEMA. HEMA folk should be very proud about what they are doing for themselves and other martial arts by sparring. The two instructors are an excellent example of the value of sparring. With it, you need to be aware of sparring's limitations. Without it, you don't really understand the art, only the theory of it. It is important for your students to spar and for you to spar to get the best understanding of HEMA. Sparring can be practiced in a variety of ways, including in what are really opposed drills more than true sparring. The most common way to practice sparring is to line the students up, have them fight, and the winner stays in to take on the next challenger. This is called King of the Hill. You, as the instructor can watch or join. A variety of this I do is that I have one student fight everyone. Win or lose, he or she fences everyone in the line. After, we gather up and I tell the students what I saw, what to work on and what went well. I then have the next student step up and fence everyone. In this way, the student learns to be able to fight for a longer period of time and they get feedback on their performance. Another form of sparring is more of a drill. I choose one student to perform a task and have another student attempt to thwart it. One example is I have one student throw a single heavy cut at another student's head. The attacker only gets one shot and is told to throw with a lot of power, but not to do anything tricky like change the angle of their cut at the lat moment. The defender is shown a technique to counter the heavy cut. The objective is for the defender to successfully avoid/deflect/parry the attack, but it's not necessarily easy because the attacker is genuinely trying to win. Yet another form is, as the instructor, to fight everyone. I do this from time to time and win or lose I stay in. I sometimes let my students win. How? If we were working on a particular type of technique, I throw attacks that the technique can defeat, or create opportunities where the technique can be applied. If the students do as I taught them, they win. If not? They usually, but not always lose. As the instructor it is ok to lose to your students. Your students are not living pells, they are not there for you to get better- they're there to learn and you are there to teach them. Sometimes. Even I need to brush up on my skills and at times leap into the fight with every intention of winning every match! That said, instructors should remember their role. If you are beating your students over and over and not telling them why- then don't be an instructor. Mimicking bad behavior or usual behavior is another form of sparring, similar to the opposed drills. I have the students line up and I pick one of the better ones to be the Bad Guy. I tell the Bad Guy to fight a certain way. This can include, seeking a double hit, targeting only the hands, always retreating, always advancing, delivering a hard right to left cut, or thrusting with no sense of measure or tempo. It is surprising how well they can do! The students need to figure the Bad Guy out and in doing so learn there are roughly three types of opponents they will face and that these three have to be treated differently. Sparring and getting good at it is not a video game. You do not go up in level and ergo defeat those of a lesser level. In sparring and from historical anecdotes we know that new fighters could be especially dangerous to veterans. Newb - The new fighter, or Newb, or Newbie is one of the more dangerous opponents. They do not know what they are doing and so they tend to ignore feints and seek the double kill. I have seen very experienced fighters defeated by someone who just picked up a sword ten minutes ago. This is good! Students need to learn how to use their measure (distance) to feel a new opponent out and learn how skilled that opponent is. Experienced students should be able to identify new fencers very quickly by noticing how they move. Usually there is a hesitancy in everything they do. My advice when facing new fencers is to only throw attacks that also cross the line of the opponent's most likely attack. Do not feint, do not expect any reaction from your cut or thrust. Fight in such a way that if the opponent were to try and double-kill you, that they would fail at it. After a few rounds the new opponent will start to understand what they are doing. Quite quickly they will seek the double kill less, respond to feints and may even seem to do worse as they learn how to fence. That is ok. When I get a new fighter, I treasure them because their dangerous bad habits won't last long. Use it as a learning tool. Competent - The competent fencer knows what they are doing. They may know a bit more or a bit less than their opponent. This is the usual match-up in a school or even at a tournament. This is where each student can try to master their techniques and learn how to apply them against a resisting opponent who is trying to do the same thing. As an instructor this is who I work with the most. Superior - The superior student is better than their opponent. For the superior student life is pretty darn sweet. They just need to apply their skills and they'll usually win. These are the guys that tend to win most their fights in a King of the Hill and get to eliminations and finals in tournaments. They're at the stage where they are probably already teaching others. Their opponents on the other hand have a great opportunity. They can learn how to fence someone better than them! Historical sources give some clues to this, with Giganti giving explicit advice. Here, tricks, unusual but valid techniques, and feints play a greater role. The inferior student can learn how to mitigate someone's speed, or strength or even skill. For the inferior student, fencing a superior one helps train them to become superior themselves. As with all categories, there are exceptions and things I've left out, like full on crazy people, or very tall or very short fencers, or the sinister left handed types. However, for teaching purposes, having three categories, new, competent, and superior can assist in giving the proper feedback. New fencers need to learn the basics, competent fencers need to learn how to apply increasingly advanced techniques, while superior fencers need to fine-tune themselves, but also understand they are helping others improve by virtue of being good at sparring. Sparring is important, but it isn't everything. Students who only spar and never learn about the H in HEMA are doing the whole movement a disservice. Sparring is fun, it's nice to win tournaments, and I'm not ashamed to say I have ship wheel covered in the various plastic medals I've earned. That said, HEMA at its core is about source material. 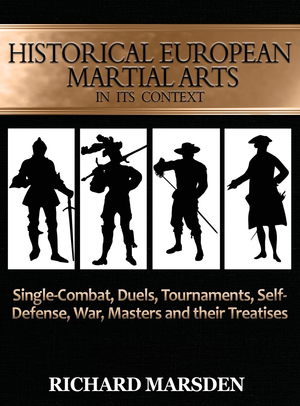 Students need to be exposed to source material and the context of HEMA. Part of the reason I wrote a book on HEMA was to get people interested in the culture of the source material. There was a reason people fought and a reason they used one weapon over another and it wasn't always one of picking the most superior weapon. There were rules in duels as well as expectations. There were also down and dirty tactics that broke all the aforementioned rules. Learning HEMA strictly through sparing misses out on what makes HEMA different. It is not an art we are taking and trying to divorce from the past and make into something designed to win sparring matches, it is a martial art we are taking and trying to revive. Sparring just helps us get there. course, fencing for fun and money. Check out HEMA in its Context!